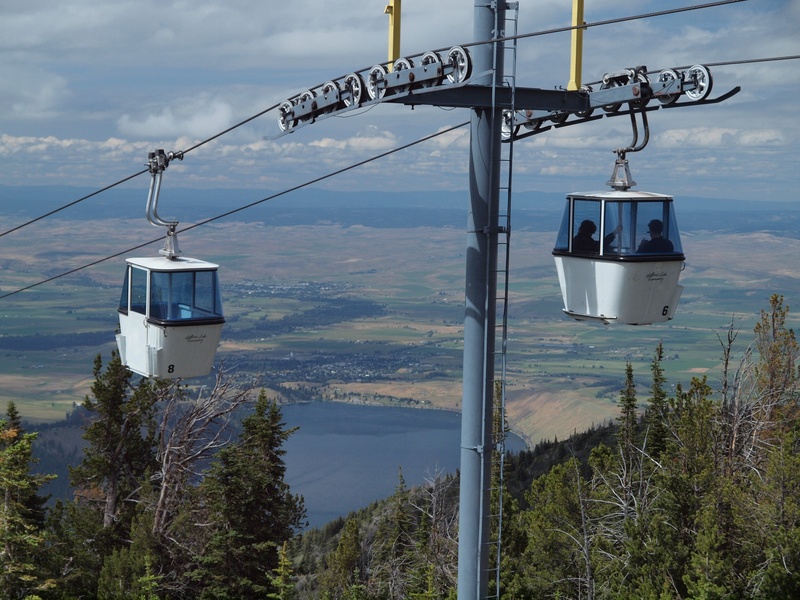 On our second day there we took the tram up to the top of Mount Howard, named for Gen. Oliver Howard who led the army in pursuit of Chief Joseph’s band as they fled the Wallowas toward Montana. The gondola lifted us up a steep slope right into a cloud, a disappointing development as the whole idea was to see the spectacular views. We sat on a bench with chipmunks crawling into our laps looking for a handout and enjoyed being enveloped by mist, the hard-scrabble, one-sided trees at timberline floating in and out of view. The Clark’s nutcrackers called back and forth while children delighted in feeding the chipmunks. As we hiked around the mountain top the fog began to lift and we now saw that we were surrounded by snowy, Alps-like peaks. After so many months of drought in Taos it was thrilling to see big, plump glaciers feeding streams gushing down the mountainsides. On the way out of the valley the next day we paid our respects to Old Chief Joseph. He was given the name Joseph by the Presbyterians but renounced Christianity, tearing up the “Book of Heaven” when the Americans tried to force the new treaty that would require the removal of his band from the Wallowa Valley. Before he died he made his son, also called Joseph (though his Nez Perce name meant Thunder Rolling in the Mountains), promise never to sell the land where his mother and father were buried. We don’t know where young Joseph’s mother was buried but Old Joseph was moved to this site because his grave had been twice vandalized. 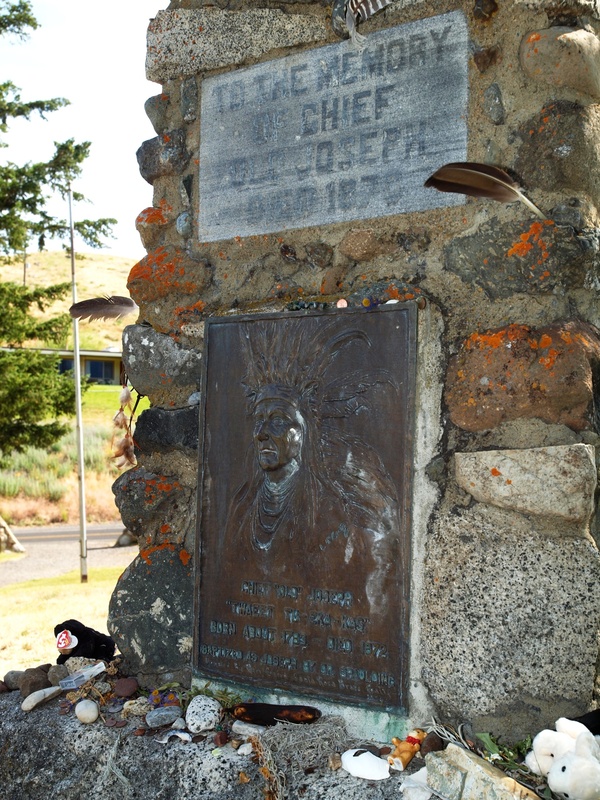 Old Chief Joseph's grave was moved to this site near Joseph, Oregon after the original site was twice vandalized. As we left an osprey feather Carol had found at the Lake at the monument, we talked about several quotes we had read by Young Joseph. We found these later in a book belonging to Wayne’s Dad (in Mt. Vernon, Washington, where we are writing this) about the Great Chiefs, published by Time-Life. 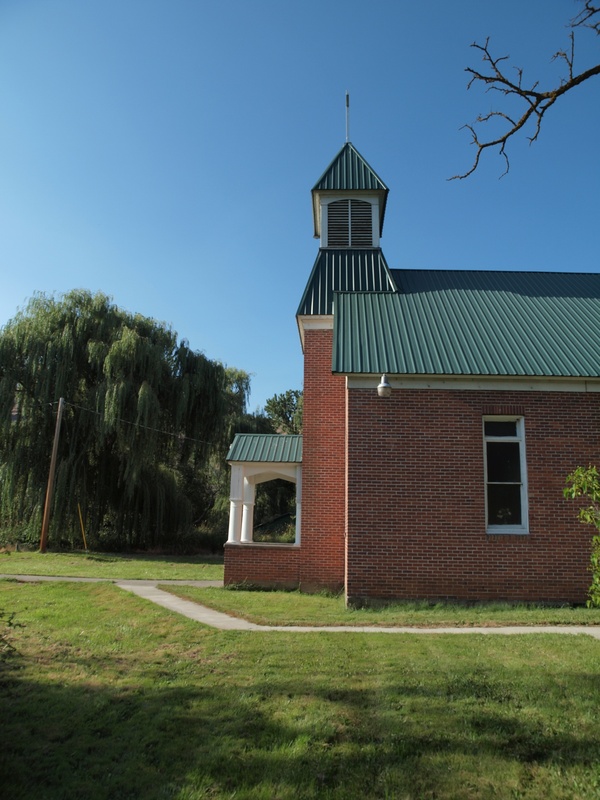 On our return visit to Nez Perce country we met up again with Corbett Wheeler who showed us the church and mission founded in the mid-nineteenth century by pioneer Presbyterian minister Henry Spalding in Lapwai, Idaho. Spalding and his wife, Eliza, traveled out West with Marcus and Narcissa Whitman as missionaries for the American Board of Foreign Missions. Their call was part of a response to a delegation of four Nez Perce who had gone to Missouri, requesting to learn more about the “Book of Heaven” (the Bible), which they had heard about from earlier fur trappers. In those days this part of the West was not part of the United States. Eliza and Narcissa were the first white women to travel into the Far West. Working through Hudson Bay Company forts, the Whitmans established a mission with the Cayuse Indians near what is now Walla Walla, Washington while the Spaldings went to Lapwai among the Nez Perce. 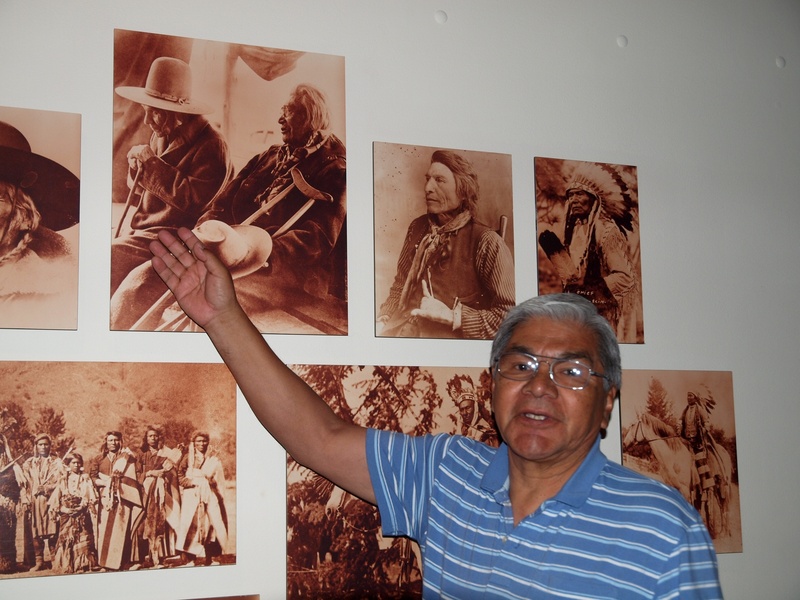 Corbett Wheeler points to his ancestor in a wonderful display of photographs at the Nez Perce interpretive center. 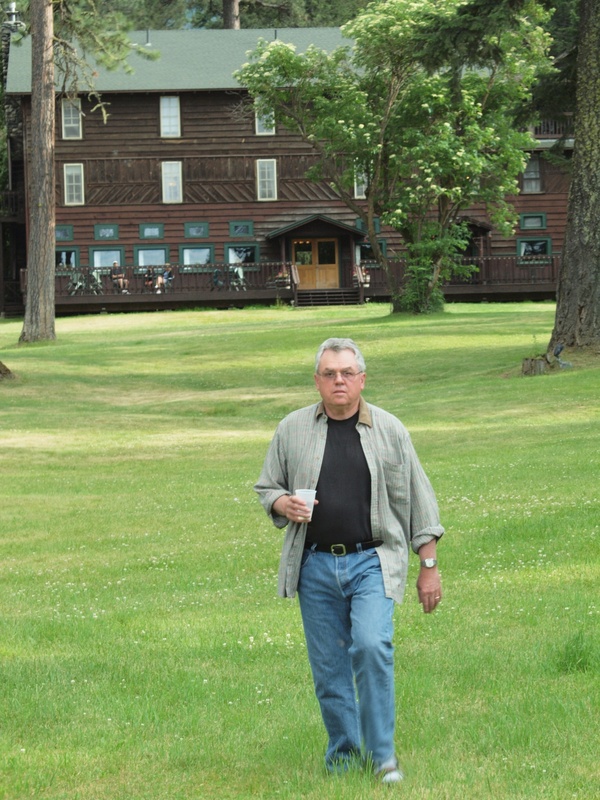 We went up the Clearwater from Lewiston to the Nez Perce interpretive center where Corbett seemed to know everyone. Among a gallery of old portraits, Corbett pointed to one of his relatives, as he had done in the cemeteries, too. Everybody is related to just about everybody else. Unlike Taos and Ranchos, the missionaries were buried on the reservation so we also visited Spalding’s grave in a nearby park. Corbett said that, between the expansive plans of the tribe and the National Park Service, the Presbyterians are always making sure their churches aren’t grabbed for museums. This Presbyterian Church is at the orginal missionary site of Henry Spalding. This is a church the Nez Perce keep proving is a living church so the Park Service doesn't nab it. In Lapwai, capital of the Nez Perce nation, where Corbett grew up, we found the old parade grounds for Fort Lapwai. From here General Howard led the Army’s pursuit of the non-treaty Nez Perce on the thirteen hundred mile trail to their final defeat at Bear Paw, Montana (forty miles from freedom across the Canadian border). Further up the river, we turned off into a beautiful canyon where we pulled up to the home of missionaries Ron and Judy. They were hosting the prayer warriors that night. 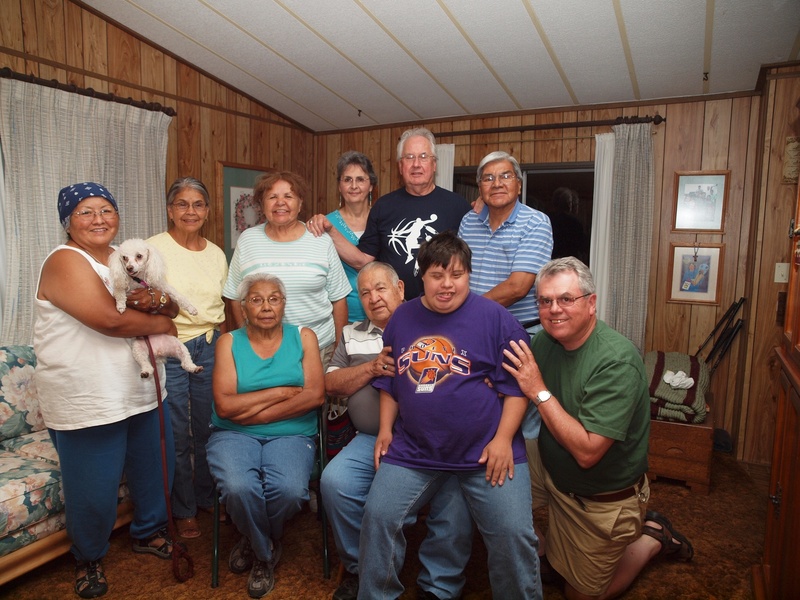 After a feast of roast pork sandwiches and salad, we all got comfortable in the living room for a long evening of hymn singing in Nez Perce, Bible study and prayer.